The Cube Teapot was a combination of modern design, successful advertising and British innovation. 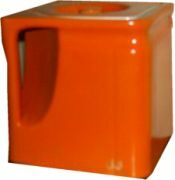 This made the Patent Cube Teapot a revolution of its day. Now it is a rare and stylish collectable item that conjures up images of the times when “everything stopped for tea”. 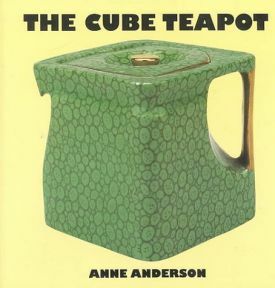 The Cube Teapot was a quest to find the “Perfect Teapot”, one that did not drip tea when poured and was easily stored away when not used without the worry of the spout being chipped. Many companies had tried to create this perfect item but rather than change the whole design they had just concentrated on one of the defects. It was only when the Cube Teapot came onto the market that the all the problems were solved. The entrepreneur Robert Crawford Johnson was responsible for the design of this revolutionary new teapot and registered “Cube Teapots Ltd” in 1917. He perfected the sought after design, one that did not drip, poured easily and was chip resistant, together with easy stacking for storage. With no spout or projecting handle the cube teapot looked exactly as it sounds – a cube. Even though it was registered in 1917 the first teapot was not actually put in to production until 1920 and it claimed to be the climax in teapot construction. The first company to produce this teapot in earthenware was “Arthur Wood” of Stoke-on-Trent. But by the mid twenties this company was not the only one to make the cube and there were variations on cubic designs by other companies who were not all producing under licence. As with any successful innovative idea there are always rivals and copies, and Johnson sought on different occasions to take legal advice although he was unable to take any actual action against his rivals. James Sadler and Sons as we know today are specialists in novelty teapot designs had produced many ranges of teapots such as the “Nesta” range which were popular with the restaurant trade as they stacked neatly on top of each other, another of their designs was the “Handy Hexagon” an almost identical design to Johnson’s cube. Johnson aware that the problem needed to be tackled decided that the only course of action was a strategic marketing plan. In 1925 he formed “CUBE Teapots Co., Ltd” and embarked on the marketing and distribution of the cube teapot and similar tea ware. Percy Aspinall was one of the directors and emphasised in his campaigns that the original article was far more appealing than any imitation. A huge marketing campaign was launched to help retailers sell the product, it included colourful showcards and booklets but the most exciting was a moving display in the window of the Leicester Showrooms of a lady perfectly pouring from the cube. This campaign was a huge success with anyone who is anyone wanting a cube teapot and the companies producing under licence increased to include big names such as Wedgwood & Co Ltd and T.G. Green & Co. Ltd. There had been a continual growth of tearooms in Britain, a place where ladies could acquire refreshment in a public place. Lyons Corner Houses are probably one of the most well known and the country’s largest and with such an expanding tea business the cube teapot was exactly what the industry had been waiting for. The Cube not just popular in cafes and restaurants became used at sea on the Transatlantic Ocean Liners. This is the epiphany of the twenties to me, drinking tea out of a teapot whilst cruising the oceans at a time where transatlantic travel was the only way to go! The Cunard Line was one of the companies using the tea ware although other vessels that were not Transatlantic Liners used it on board as well. Probably the biggest contract for the teapot was when Cunard wanted the Cube supplied on its greatest liner Queen Mary. Used by all from First Class downwards it was a daily occurrence to see people sipping their morning tea having been poured from the Cube Teapot. Because it was only the shape of the teapot that was patented potteries could decorate it how they pleased. There are many differently decorated pots, my favourite being the bold bright colours of T.G. Green but variations on decoration go from one extreme to the other. 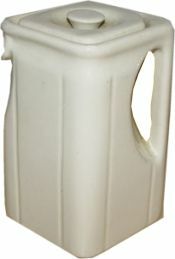 The most commonly found Cube teapots today are the simple plain white ones, or the Ivory Banded Cubes used on the Queen Mary and Queen Elizabeth which were supplied by Brain’s Foley China. Unusual decoration such as the “Shagreen” effect again by Foley or the Grimwades earthenware models are a lot harder to find on the secondary market, recently a plain Grimwades model sold for £40. As with all good things they have to come to an end and the demise of the Cube was in the early 1950s when other modern teapot designs became popular. I believe that the key to its success was definitely the high volume of self-promotion. It was also a modernist design at a time when change was accepted and welcomed with opened arms. I am always on the look out for affordable and unusual collectables and the Cube teapot definitely sits in that bracket. Although a good mint condition one is hard to find I think the hunt would certainly be worth the effort because image how you could impress any guest that might pop in on the off chance for afternoon tea! THE CUBE TEAPOT FACTS. DID YOU KNOW? · T.G. Green famously known today with collectors for Cornish Ware produced the Cube palette and cup. · Foley China Works supplied bone china Cube Teapots to both Queen Mary and QE2. · George Clews and Co. Ltd produced stoneware Cube sets for the state rooms on board Queen Mary. 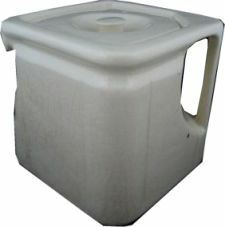 · It was said that the cube was the largest sale of any patent teapot in the world. · Health and Hygiene were also a major factor with the teapot and it was awarded the “Certificate of the Institute of Hygiene” and in 1926 a gold medal at the “Nation’s Health Exhibition”. · Cubes were also made in silver plate by companies such as T. Wilkinson & Sons. · Teapots used on board ship carry the “Cunard” name in the backstamp.